The Dunlop SP Sport 7000 tire features an all-season tread design that not only provides predictable performance on dry or rain soaked roads, but also gives a good deal of comfort and a quiet ride. This asymmetric radial tire has large outside shoulder blocks that give it better corning and response. Circumferential grooves in the tread help it handle well in wet weather conditions, as well as reduce the risk of hydroplaning. You’ll find that this tire offers a longer tread life than many other tires in this class. 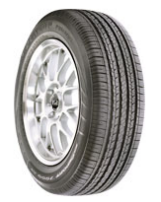 The Dunlop SP Sport 7000 tires range in price from around $95 for a 16″ series to around $190 for an 18″ series. Who Is The Dunlop 7000 Tire Designed For? Dunlop has designed the Sport 7000 as an original equipment tire or as a replacement tire for coupes and sedans for drivers wanting a tire with very good value, along with dependability and comfort in all weather conditions. Dunlop does not offer a treadlife warranty on the SP Sport 7000 tire, but they do provide a 6-months or first 2/32″ wear warranty on tire uniformity. There is also a 6-year guarantee on materials and workmanship that includes first year free replacement or first 2/32″ treadwear, and then it is prorated for the remaining period.